Melissa & Doug Toys and Puzzles Sale! 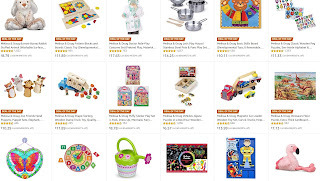 Melissa & Doug Vehicles Jigsaw Puzzles in a Box $6.57, Shape Sorting Wooden Clock $7.13, 26-Piece Joey Magnetic Dress-Up Set $8.39, Scarlet Pink Flamingo Stuffed Animal $9.09, Art Deluxe Combo Set $9.44, 18 Piece Stacking Train $10.49 and MANY MORE. Free Shipping with Amazon Prime or $25 Order. Lots of cute items at great prices!